What Have Clubs Bought & Sold? The transactions displayed were recorded by investment clubs during the month of September 2017 as reported by bivio. bivio.com is a favorite record-keeping solution for investment club accounting and has an admirable record of exemplary customer service and cost-effectiveness for many years. I’ve been an advocate of bivio as an invaluable club resource since I first met one of the co-founders Dr. Ion Yadigaroglu nearly twenty years ago. The leadership was subsequently assumed by Rob Nagler and a solid tradition of delivering a quality solution and outstanding service is currently led by Laurie Frederiksen. It’s been a while since we did a club Dashboard Diagnostics session and it’s probably time to remedy that. If you or your club would be interested in a live portfolio review using our dashboards, let me know. As many of you know, I was responsible for the annual portfolio contest at Better Investing magazine several years ago. This afforded me the opportunity to witness success as I reviewed hundreds if not thousands of club portfolios. The best practices and outcomes observed became the genesis of Manifest Investing. The bull market has been on rampage for several years. In fact, the performance since 2009 now resembles and reminds many of us of the late-1990s, a period that we often regard as a golden age of investing. Do you remember? The analysis and methodology deployed by most investment clubs involves using the business models, trends and forecasts to build a long-term expectation for the companies that we study. Good stewardship mandates that we continually monitor all of the important influences and characteristics for the stocks that we own. This is the hallmark and foundation of the modern investment club movement. Sometimes after a persistent bull market, investors can hoist the patience and discipline anchor. “This form of stock analysis does not work any more?” “P/E ratios no longer matter.” (That’s true, but only for special situations and circumstances.) Do you remember? “P/E ratios don’t matter for Cisco Systems (CSCO) … it’s by far the most strongly recommended stock on the stock market.” “Ignore that sell zone. This bandwagon is leaving the station.” We know with 20/20 hindsight and the soon-to-follow 92% drop over 1-2 years that some bandwagons are more cruel than others. We also know that CSCO was squarely in the sell zone of most of our stock studies at the time with a long-term return forecast in the negative double digits. We’re human. That’s why anchors matter. bivio Clubs Activity Report: The Long & Short Term Perspective. (October 7, 2017) Projected Annual Return (PAR): Long term return forecast based on fundamental analysis and five year time horizon. Quality Ranking: Percentile ranking of composite that includes financial strength, earnings stability and relative growth & profitability. bivio Clubs Net Buys vs. Sells: Number of reported purchases minus reported sales. The data is ranked (descending order) based on this criterion. VL Low Total Return (VLLTR): Low total return forecast based on 3-5 year price targets via Value Line Investment Survey. Morningstar P/FV: Ratio of current price to fundamentally-based fair value via www.morningstar.com S&P P/FV: Current price-to-fair value ratio via Standard & Poor’s. 1-Year ACE Outlook: Total return forecast based on analyst consensus estimates for 1-year target price combined with current yield. 1-Year S&P Outlook: 1-year total return forecast based on S&P 1-year price target. 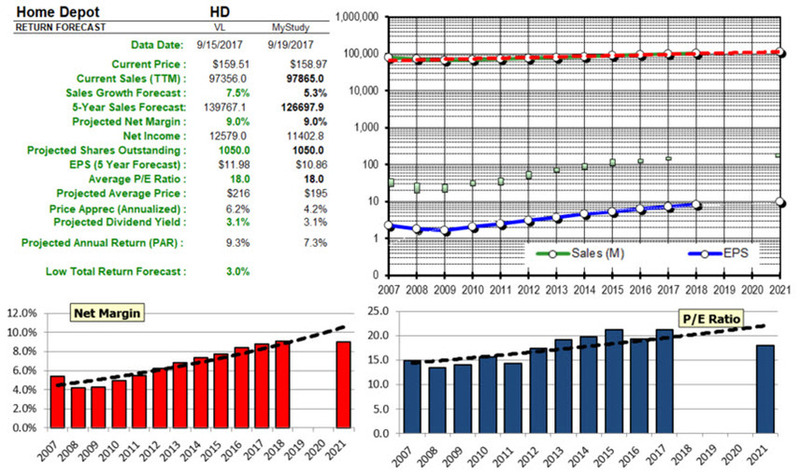 Home Depot (HD): Business Model Analysis. The assumptions for Home Depot for a sales growth forecast of 5-7%, net profitability of 8-9% and a projected average P/E of 18x generate a return forecast in the mid-single digits. Home Depot (HD) is not Cisco Systems (CSCO). Home Depot is an exceptional company that dramatically weathered an industry DEPRESSION and not only survived but thrived. It ranks among the most widely-followed companies by subscribers at Manifest Investing and trust me, we’re grateful. But most of us would consider it a “Strong Hold” — not a “Buy” — under current conditions and based on the accompanying business model analysis. Following a long bull market, some club participants begin to question the return forecasts of some of their favorite holdings. Some live in fear of the next bear market and urge colleagues to stick to blue chips and it doesn’t matter what the price or return forecast looks like. Many, many average investors flee to defensive blue chips and this has been going on for a long time as talking heads and pundits have been telling us to run for the hills for YEARS. The result of this is that many of our foundational favorite stocks are no longer attractive purchase candidates. Yes, quality matters. Quality is what keeps us safe when the next correction or bear market finally does arrive. Because it will. Nobody can tell you when. But, PRICE MATTERS TOO. Because return forecasts matter. Buying stocks with relatively low return forecasts will compromise your long-term returns and results. For some context, we track approximately 2400 stocks at Manifest Investing. The average return forecast for those stocks (based on the collective results of a pile of stock studies) is now 6-7%. Many of the companies at the top of the activity list have fairly weak long-term forecasts. We publish versions of this long-term and short-term perspective profile so that we can compare some trusted second opinions. In this case, note the general level of the low total return forecasts according to Value Line. We also check the price-to-fair value (P/FV) from Morningstar and S&P. A value less than 100% is regarded as potentially “on sale.” A value greater than 100% suggests that a stock is at least, temporarily, overvalued. Or expensive. Scan the list from top to bottom. The lower return forecasts and expectations are generally at the top of the chart while the opposite is true at the bottom. Home Depot (HD) is an example of a company that typically will reach a stock price plateau. Some of those plateaus have historically extended for many years. In many cases over the years, the stock price stagnates during an extended run where the business fundamentals steadily improve. This was the case for Home Depot a few years ago. I have no idea what lies ahead for Home Depot, it’s just that I wouldn’t be the least bit surprised by a plateau. Which brings us to General Electric (GE) … the most heavily sold stock during September 2017. In a game of word association — group therapy for GE shareholders — one of the most common words might be “fatigue.” GE shareholders are exhausted. How long can doldrums last? For this reason, and perhaps some tax-related selling at this time of year, we understand why an investor might feel compelled to sell GE. But … as you complete your business model analysis, be sure to account for the dramatic changes in the structure of the company over the last few years. The General Electric of 2017 no where near resembles the General Electric of 2014. The financial component has been divested, a number of less profitable business units have been shed and the company on our screens is a different animal. Much of what they have retained and intend to strategically exploit are world class leaders in their enterprises. Take power generation and jet engines. World class. GE has added the remnants of Combustion Engineering and a number of water technology innovators to the mix. Their emphasis on deploying technology in the realm of healthcare continues to expand. GE has new executive leadership. Long story short — you can’t use much of the data array older than a year or two as you build a representative understanding of what the future may hold for GE. Long story even shorter — our colleague Hugh McManus has been accumulating General Electric (GE) for the last few months as a participant in our monthly webcast series known as the Round Table. If you’re “selling” your shares, Hugh and his fellow knights and damsels are “buying” them. Hugh has a track record as a very successful stock picker and is notorious (and respected) for his long-term perspective. GE will be our featured stock this month. Clicking on the PAR (Projected Annual Return) column header will sort the return forecasts from highest to lowest. One of the most critical aspects of building a successful long-term performance is to discover and prudently own some high-quality faster-growing companies. During September and October every year, we turn over leaves and hunt down promising needles in haystacks — the types of companies (think Bio-Reference Labs, Neogen, Masimo, Mesa Labs, Simulations Plus, Universal Display and a number of others) that bolster long-term returns. The search for promising smaller companies should never end and we intensify our efforts during the fourth quarter each year to — in some cases — take advantage of tax-related selling and the January Effect. 1. Check the rigging on your anchor. Don’t let your friends be average investors. Invest With Your Friends. Thanks, bivio!